I can be drowning in skincare at any one time, so it takes a lot for me to genuinely fall in love with a product and stick with it to the very end. It’s incredibly easy to flitter from one to the next, continually searching for the holy grail that will leave my skin feeling radiant and healthy; there has to be something really rather special to keep me going back for more – let alone a second bottle! Many of the formulations we see on a daily basis are incredibly similar, the only differentiating factor the pack it comes in and the marketing noise that accompanies it. But sometimes I just can’t get enough of something and bi-pass all others in favour of a daily hit; here are three great skincare products that I’ve used all the way to the very last drop, and have already got a back-up bottle on stand-by… That’s how much I rate them. If you need to invest in some new products for a new year, these are definitely a great place to start. and reduce water loss on the surface of skin,) but to increase the effectiveness of other skincare products. The science behind this little futuristic bottle is insane, but in a nutshell it preps skin and ensures it’s in the best possible condition to recieve your usual eye cream, serum and moisturiser. The formula is super lightweight and quickly absorbed, meaning this isn’t an additional step you’ll worry about or cut out a week or two in; even if you don’t have time for a full-on morning routine, a touch of this will help you look and feel hydrated all day long. Unlike many other ‘boosting’ products, this is totally faff-free, effective and a pleasure to use – rather than a chore. Ever wished you could target your skin concerns as needed, where needed? Clinique’s Smart Eye Treatment does the usual smoothing of wrinkles, evening of skin tone, lifting and brightening, but the uniqueness is that it’s clever enough to give your skin the attention it requires – without overloading areas which don’t need so much love. I’m a big fan of the original Smart Serum, so I was ecstatic when this eye version landed on my desk some months ago. The texture is beautiful, instantly cooling and refreshing even the most tired of eyes, while it takes only a few seconds for it to be fully absorbed into skin. Speed is a big thing for me, and Clinique have totally conquered this problem – I can just dab it on with my finger and carry on with the rest of my routine. Although it doesn’t totally transform my under-eye area, it does delicately smooth and tighten while helping to fight the signs of ageing over a longer period of time. It’s a joy to use – simple. This best selling serum integrates ten ‘evidence based’ (there are clinical trials to back absolutely everything up!) active ingredients, with a formulation carefully designed to help prevent further skin ageing, perfect existing signs of ageing and help the skin to perform better. It improves radiance, moisture, elasticity and luminosity, reduces the appearance of lines and wrinkles, plus it rejuvinates the skin’s structure and texture – but this is so much more than just another serum. I adore the luxurious rich balm texture that’s a pleasure to massage into skin, leaving the surface feeling pampered rather than overloaded. MeruMaya is a brand I really trust and a brand that always delivers; they’re focused on effectiveness rather than spending all their time on marketing slogans and fancy packaging, which is somewhat refreshing in a world overloaded with what can only be described as ‘gumph’. If you’re a bit scared of serums or don’t know where to start, this is universally brilliant and an incredible price point for what’s inside. 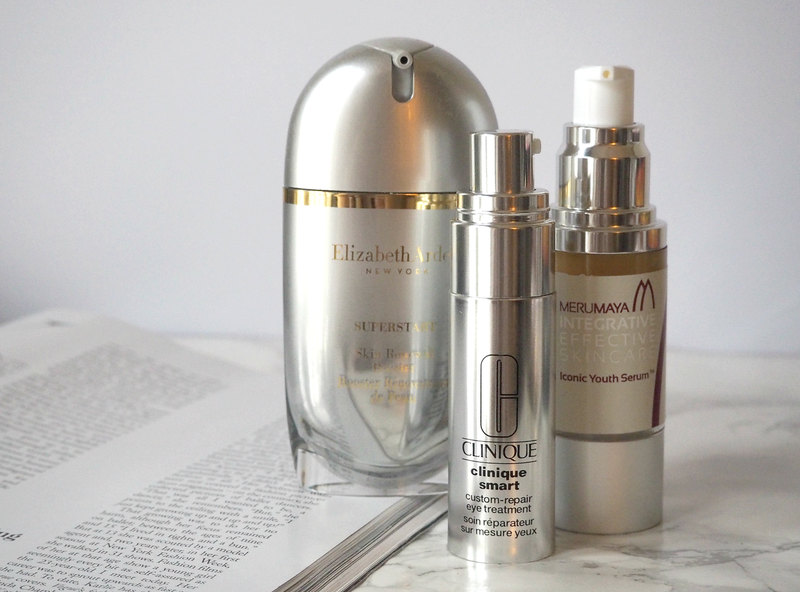 Have you tried any of these three skincare favourites? Eye massage is really effective at draining away dark circles – plus drinking lots is the age old solution! Products will only help so much. They're a great brand for that – it's all about customer satisfaction and ensuring the best results they can get. Well worth checking out their other products; they're not the prettiest, but they work. The beauty editor of Stylist has admitted she's basically replaced all her skincare with this one item too – which reaffirms my love!